Although there is a lot of overlap between the cuisines of different South Indian states, each region also has its distinctive touch and favourite recipes. Likewise, there is a lot of similarity between the food cooked in Kerala, and that of coastal Karnataka and Tamil Nadu. Yet, there are all-time favourites like Unni Appam and Puttu that stand apart! Keralites use coconut abundantly in their cooking, because it is available in plenty in that region. Most veggies are cooked with coconut-based masalas, and coconut is also used in the preparation of sweets and snacks like Puttu. A lot of native fruits and veggies like jackfruit, yam, raw banana, yellow banana, ash gourd and pumpkin are used in the cooking. The curries usually have a base of coconut or coconut milk, with tinges of green chillies, ginger and sometimes garlic. Among the spices, cumin is used popularly, and there are some special curries that are flavoured with freshly-ground pepper, which also grows in the region. A stout and stocky type of red rice is used there, but with more and more visitors flocking to God’s Own Country, restaurants have also started serving white rice. The moment one thinks of Keralite food, some all-time favourite combos immediately come to mind. Idiyappam with Vegetable Stew or Puttu with Kadala Curry are totally sumptuous and satiating foods that make a complete meal! These are the two most famous breakfast combos of Kerala. The Unni Appam, made of broken wheat, rice, banana and jaggery, is a tasty sweet snack that is very often made in Keralite households. It is made as an offering to God, and served to the family. Unni Appam is made in almost all Keralite temples, and sold at the temples’ prasadam stalls. Sweets and savouries made of jackfruit and yellow banana are also classic dishes to try in Kerala. The raw jackfruit chips have a special texture that is both crisp and chewy at the same time! This fruit is also cooked into a puran and used to make a steamed delicacy known as Ela Ada, in which the jackfruit stuffing is placed inside rice pancakes, wrapped in banana leaves and steamed. The banana leaves impart a special flavour and aroma to the Ela Ada, making it a unique treat that’s on the must-taste list of any foodie. Yellow banana is one of the favourite fruits in Kerala. It is steamed or roasted with the peel on, then peeled and served. It can also be enjoyed raw. On a rushed day, a Keralite will just walk into a roadside tea stall to have a simple but sumptuous meal of yellow banana and a glass of black tea! Any festival, puja or special occasion in Kerala is incomplete without a spread of kheers or payasams, as it is called there. Milk-based kheers sweetened with white sugar, dal kheer sweetened with jaggery and their own indigenous jackfruit payasam (Chakka Pradhaman) are must-have items for any celebration! Apart from the usual kheer made of broken rice cooked in milk, Kerala is famous for its Ada Pradhaman. Rice paste is spread into thin sheets and dried in the sun, to make a papad like food known as ada. This ‘ada’ is crushed into a small, handy size and sold in packs. Ada is cooked in milk or coconut milk and sweetened with sugar or jaggery to make a mouth-watering kheer. This is one of the signature recipes of Kerala! 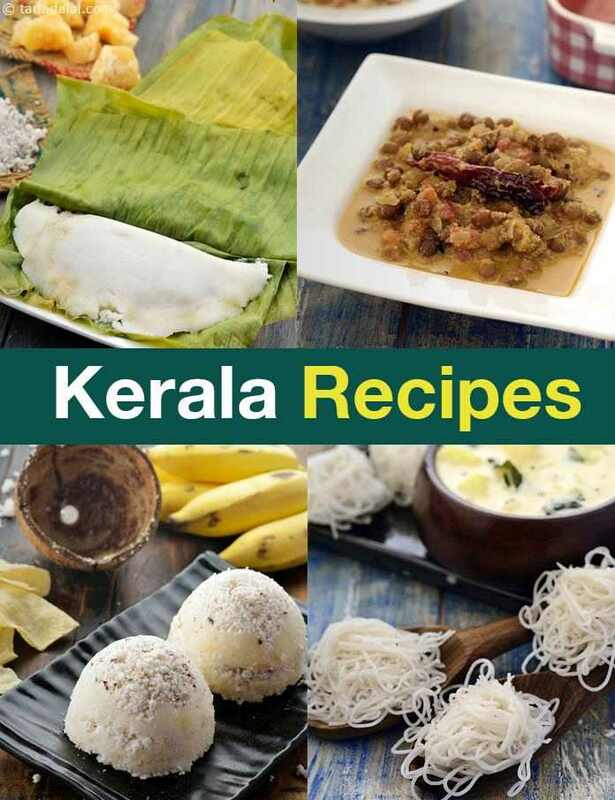 Enjoy our collection of Kerala Recipes and artilces on South Indian recipes below.